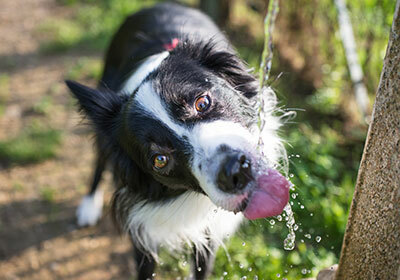 Did you know that like humans, our pets could also suffer from heat stroke? Without the proper hydration, shade and air conditioning, our body temperatures, along with the body temperatures of our pets, can quickly rise into the hundreds. At Boerne Air Conditioning Experts, many of our staff are pet owners, and we love our dogs and cats. With their safety in mind, we want to make sure we do everything we can to keep them safe in the heat. In the summer, most dogs and cats will shed, reduce movement and pant more to endure higher temperatures. If your home is equipped with a thermostat, you can set your HVAC systems to higher, more energy-efficient levels while you’re out of the house. For example, most dogs and cats will be perfectly fine at temperatures between 78-80 degrees in throughout the summer months. You should also make sure that your pet always has access to clean, cool water and a shady place to rest while you’re away. Also, make sure that any large or outdoor kennels have adequate air conditioning, and when in doubt, bring your pets inside. It can also help to keep your pet’s coast well groomed. Long coats can serve as insulation from the heat if it has been groomed to remove the undercoat. In terms of additional pet safety tips regarding your HVAC systems, it’s important to be aware of the location and condition of your vent covers. Animals will get into the smallest places. They can be curious when they’re unaware of the potential dangers that exist within your home’s heating and cooling systems. Depending upon the size of the vents in your home and the size of your pets, your pets can potentially enter into the vents and become stuck. Be sure to place vent covers throughout all the entry and exit points that exist within your home. You might even consider denying access to any areas in your home that can become a safety hazard for your animal. If you do not currently have covers for your equipment, contact our team at Boerne Air Conditioning Experts to have them installed in your home. This will help to prevent accidents from occurring in your ventilation system and will keep your pets out of danger. Typically, your home’s air conditioning and heating units are located outside the home, or sometimes even in a basement—making them easy to navigate around; however, it’s important to still take the necessary safety precautions to ensure that your pets cannot access or tamper with the equipment. If a pet does interact with your HVAC equipment, it can not only cause damages to your equipment and household, but it may also injury your pet. To avoid this issue, block or fence off areas where your dogs or cats can enter and become stuck. Also, consider teaching your pets to stay away from certain areas in your home, or lock basement doors and rooms that contain heating and cooling equipment. For additional tips about protecting your pets in the heat, or safety tips for your HVAC equipment, feel free to reach out to our team at Boerne Air Conditioning Experts.